Director – Bernard L. Kowalski, Screenplay – Leo Gordon, Producer – Gene Corman, Photography (b&w) – John M. Nickolaus, Jr., Music – Alexander Laszlo, Art Direction – Dan Haller. Production Company – AIP/Balboa Productions. In the Florida backwater bayou of Clearwater, game warden Steve Benton puzzles over the disappearances of several people. Local storeowner Big Dave Walker finds his sultry wife Liz consorting with Cal Moulton and chases the two of them into the swamps with his shotgun, only to see them both snatched by creatures in the water. However, the authorities disbelieve Big Dave’s story and think that he killed them. Steve believes otherwise and determines to find what is responsible for the killings. Eventually he realises that the bayous are infested with leeches that have grown to giant size possibly because of atomic radiation from nearby Cape Canaveral. Attack of the Giant Leeches comes from Gene Corman, the lesser known younger brother of infamous low-budget producer/director Roger Corman. During the 1950s, Gene followed Roger’s lead and produced a handful of B movies – Hot Car Girl (1958), I Mobster (1958), The Secret of the Purple Reef (1960) – and ventured into Roger’s trademark monster movies once or twice with Night of the Blood Beast (1958), Attack of the Giant Leeches and Beast from Haunted Cave (1959). Gene produced several of Roger’s films during the 1960s and others throughout his career – most notably Sylvester Stallone’s F.I.S.T. (1978) and Sam Fuller’s The Big Red One (1980) – but nothing that comes anywhere near Roger’s extraordinary output of over 400 films. 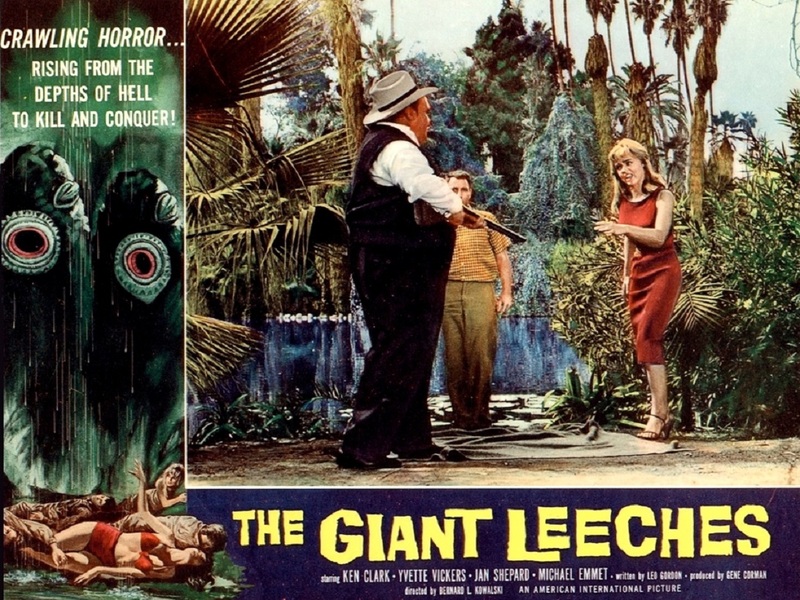 Attack of the Giant Leeches was directed by Bernard L. Kowalski, a close associate of Gene Corman who made Night of the Blood Beast and two other non-genre films for him – Hot Car Girl and Blood and Steel (1959). Kowalski directed a great deal of television between the 1960s and 90s and is best known for films such as Krakatoa: East of Java (1966), the horror Western Black Noon (1971) and one further monster movie SSSSSSSS! (1973). Half of Attack of the Giant Leeches is not too bad a B movie . Bernard L. Kowalski generates a wonderfully heated atmosphere of torrid adultery in the swampy backwaters. There are some great characters. The overweight general store owner Big Dave, played by 1950s B movie actor Bruno VeSota, who was also the director of The Brain Eaters (1958). His wife Yvette Vickers played fairly much the same role of the seductive strumpet in Attack of the 50 Foot Woman (1958) and has gained a certain cult fascination among B movie aficionados for her sultry performances. She manages to fairly much steal the show here, winding husband Bruno VeSota around her little finger or sensually oiling her legs in the middle of a scene. Kowalski generates passable atmosphere and tension during the searches and the lurking around the swamps. This section alone would have made for a great film noir. It is however when Attack of the Giant Leeches reveals its B monster movie colours that it starts to go downhill. It is not a film with particularly high ambitions. Most of it never emerges beyond the setting of a single lagoon, while the giant leeches never take on any widespread threat, attacking civilisation or large cities as they did in almost every other 1950s monster movie. Certainly, this puts Attack of the Giant Leeches in the same boat as another 1950s classic that it is owes some things to – The Creature from the Black Lagoon (1954). Unfortunately, the leeches are not particularly convincing creatures and never hold much menace. The film is over almost before it begins (it only runs for 62 minutes) – the leeches are despatched with dynamite, Yvette Vickers is rescued (although the fadeout leaves us unclear as to whether she is dead or alive) and the threat abruptly ended. Inevitably, the atomic monster movie angle that dominated the decade rears its head with it at one point being speculated that the leeches’ giantism is due to the swamp’s closeness to Cape Canaveral and that they have mutated as a result of the atomic radiation used in the initial stages of rocket launches. 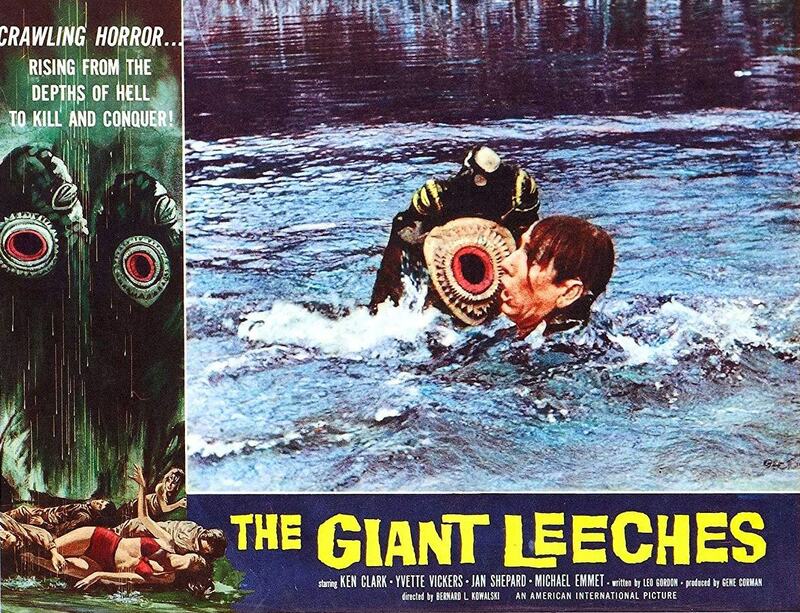 The film was later remade surprisingly faithfully as Attack of the Giant Leeches (2008).